This is a question that I get on a daily basis. Here’s an excellent example of how to use Twitter efficiently and effectively in a marketing campaign. Note: screen shots were taken by Amit Gupta from Photojojo. He’s an amazing entrepreneur and all-around-nice guy that I had the pleasure of meeting back in my iLovePhotos days. Here’s a great interview with Amit that I edited. From Wikipedia: MacHeist is a website that resells Mac OS X shareware. 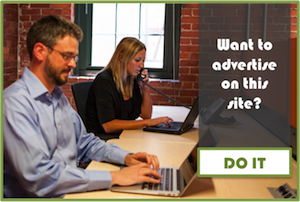 The site has become known for its marketing tactics. 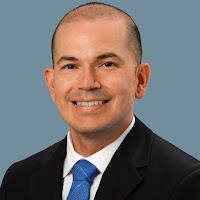 These tactics include challenges (or “heists”) that entitle successful customers to free software licenses and/or discounts, as well as the concept of selling software in a bundle that increases in size as more customers purchase the bundle. The site was founded by John Casasanta, Phillip Ryu, and Scott Meinzer. Step 1: Provide a great reason for people to pay attention to your product or service. MacHeist does not develop software but resells it. Their talent is in finding key software that people want and make it free and/or provide a deep discount. Providing something for free is a true art and is reviewed greatly in the book Free: The Future of a Radical Price by Chris Anderson (author also of The Long Tail). 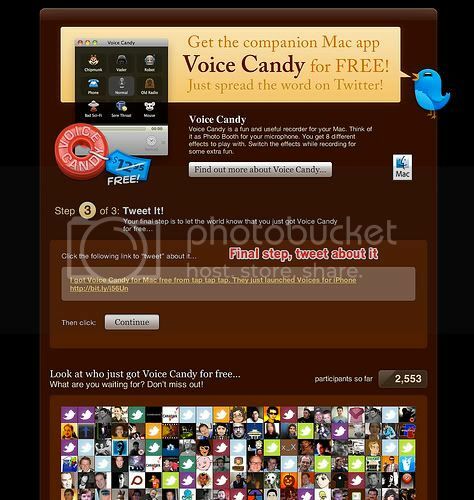 MacHeist did it right by offering the $12.95 iPhone app Voice Candy for FREE! Step 2: Don’t ask for an e-mail or a sign-up – this is a Twitter promo! This is the part that gets people confused. Why would you not want to gather e-mail information for future e-mail updates? While permission-based e-mail marketing is a valid strategy, this is not the place for it. 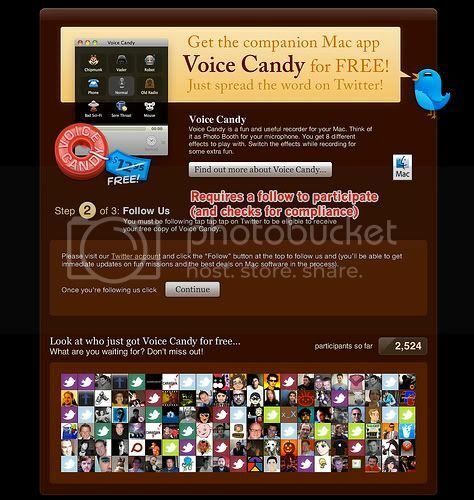 Your mission here is to provide a one-for-one exchange, a tweet/follow for a free download. Asking for an e-mail would become a two-for-one exchange so people might feel turned off. Step 3: Provide a simple process for following your Twitter account and tweeting your well-designed tweet. Provide a great incentive (from the point of view of the customer, not yours!) to act on your Twitter campaign. Keep it straightforward and ask O-N-L-Y for a follow and a tweet. Craft a simple, short and strong tweet. Bonus: if you’re able to design a mosaic (like the one from MacHeist) of the people that have acted on your campaign, that’s awesome! 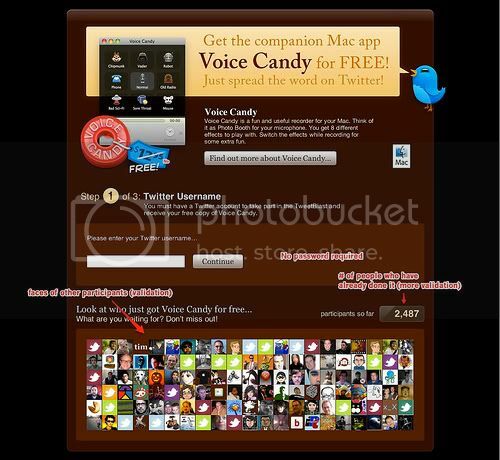 However, a RSS feed of a Twitter search looking for an exact match of your tweet would work too. Previous Article← How Does Twitter Spam Happen? This easy, three-step process is an excellent description of how businesses can successfully use Twitter in their marketing. Thank you for publishing this. I plan to retweet this so others can benefit. The idea of Twitter is quite simple: bring the notion of mobile SMS to the internet. The cell phone market was noticing a steep decline in voice communication and a large growth in text messaging and instant messaging.That’s why people today are immediately taking advantage of Twitter by promoting their products or to advertise their businesses. You can even use Twitter to promote your web page or website in order for you to generate targeted traffic flowing into your site and start making some money. This is very awesome article for all twitter user.I really thankful to you for sharing this article. Thanks you so much. ………………..